Minimize fine lines in under 30 minutes. Lunchtime is a great opportunity to drop in for a quick 30 minute treat to dodge those sleepy afternoons at your desk and return with an overall rosy glow. 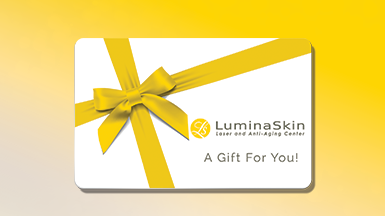 LuminaSkin’s microdermabrasion is a part of our signature medical facials. A microdermabrasion is a treatment that improves wrinkles and skin texture, minimizes pores and reduces age spots leaving your skin more supple and vibrant. I love my microdermabrasions. My skin feels so clean and smooth and always has such a nice, healthy glow. They also have package specials which brings the price way down. A gentle way to healthier skin, microdermabrasion is a skin resurfacing system designed to remove the topmost layer of skin leaving it more supple and vibrant. Microdermabrasion improves uneven skin tone, texture, age spots, minor to moderate early-aging fine lines, acne scaring, and large pores. With the DiamondTome™ Wand (our brand of choice), we remove the most superficial, sun damaged layer of the skin by gently exfoliating the dead cells with a natural diamond chip while at the same time vacuuming the dead skin away. The result? A radiant glow and softer, smoother and cleaner skin after the first treatment with no down time or pain. For people on the go, an exfoliation treatment offers exceptional benefits. Ideal for a special event or as a program for overall skin rejuvenation, this treatment is non-invasive, painless and requires no downtime from work or social activities. Normal activities may be resumed immediately after treatment. Your skin is free of redness, irritation and particle contamination. Improve specific skin conditions and rejuvenate the overall health and appearance of their skin. Microdermabrasion treatments offer a wonderful alternative or compliment to chemical peels, the DiamondTomeTM Skin Resurfacing treatment is non-invasive, pain-free and requires no down time after treatment.